Hopefully, you didn’t fly to Vegas and gamble away your life savings betting that I am not using blue in our mountain house. The odds were against it – therefore you could have CLEANED UP!!! And to be fair at first I was pinning mostly grays and mauves, telling myself that I can eliminate blue and instead do other colors in my own home. And maybe I should! Then Brian threatened divorce (jk) so I came to my senses and decided to go with the colors that surround a mountain/lake cabin – a lot of blues and greens. After my gray and white phase, I found myself pinning these moody colors, these mid tones that feel so cozy and special. Maybe it’s the pretty lighting. Maybe it’s the styling. These colors feel mountain cabin-y to me and even in the summer, I think they still feel ‘lake-y’. For the main areas (living room, stairway, loft and our master bed and bath) I’m likely choosing a neutral color, but for the bedrooms and bathrooms, I’m leaning VERY much towards some of these tones. The mixing of the tones here is super compelling, although I don’t know if I will end up doing that in our house. But again, its so pretty. I’m dying over the photo on the left (above) and a huge source of inspiration to me for the cabin. 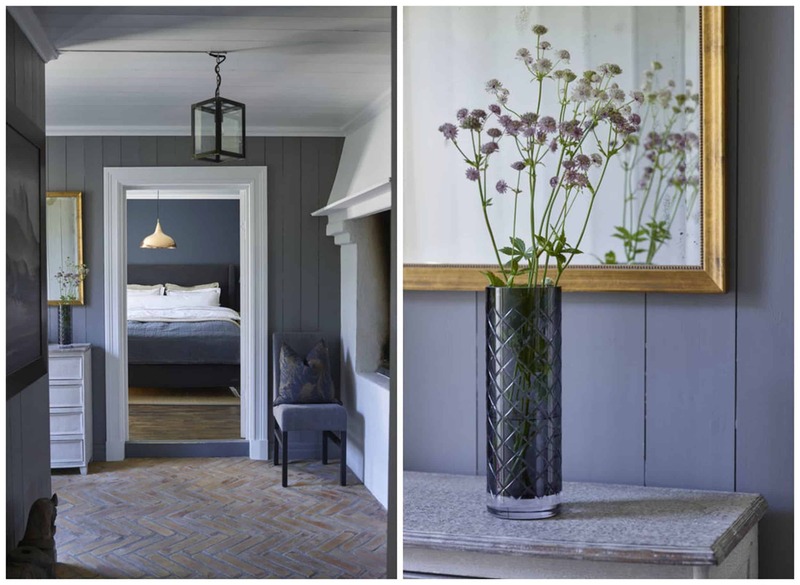 There is something so classic, yet Scandinavian about it and yet so cozy like a cabin. The lantern style pendant is unexpectantly timeless and it says ‘traditional and country’ without being too ‘trendy farmhouse-y’. Then the herringbone and the vertical cladding adds quiet texture. I tell my team all the time that I love a ‘peeking into another room’ shot like that one because it gives you so much context for a house. Can I do a dark moody bedroom? Maybe for the kid’s bunk room? Maybe for the guest room? It just feels so appropriate up there, despite all my initial imagery of lighter spaces. If you haven’t got the memo yet, Brian is basically winning this style battle and it’s going FAR more ‘cabin’ than ‘chalet’ but that’s ok because turns out we don’t live in Switzerland and I can’t say ‘chalet’ without wanting to punch myself in my face because it sounds so pretentious. But that gray cladding on the ceiling? You BETCHA. That above shot (which is surely a set) does make me feel all cozy, with that color being so soothing. And the below says ‘cabin’ in a way that also says ‘color’. Fine. I like both those things. The tones of all of these say ‘I’m cozy and inviting but maybe my kids will be normal’. Life is good here. I have blue on the wall, a pretty fabric covered strangely low light fixture and a wooden elephant in the window. MY LIFE WILL BE EASIER IF I PAINT MY WALL THIS COLOR, RIGHT?? My kid’s bunk room needs a treatment like this and they just might get it. Maybe if they stop testing my patience all day every day asking for packaged snacks I’ll give them the bunk room of their/our dreams. I’ll go moodier if you push me and I can be pushed. I love that room so much and if there is one thing that turns Brian on it’s a ‘modern paisley settee’. Put that beautiful blue on a wall with some interior board and batten and both our dreams come true. And by ‘our dreams’ I mean, my dream of texture and his dream that our house isn’t a minimalist stark museum-like hole. Oh boy, I’m so excited about this house. Is that above blue the perfect ‘powder’ or is just styled right?? I’ve tried to find such a blue for a while and unless it’s styled perfectly and shot with the perfect light, guess what – it looks ‘baby blue’. But I want that blue. It’s so happy but soothing – but be warned – if you choose a ‘blue’ that feels on the gray side know that it’s most likely going to look ‘baby blue’. If you choose a gray that looks a TINY bit blue then you might get closer to that non-baby-blue-but-mostly-gray that you actually want. Greens are the color of trees, and YOU KNOW HOW I FEEL ABOUT A TREE (see this post if you don’t, or see my daughters first and second tree mural rooms). But how do you get that perfect green? What is it about these colors that don’t feel dated (hunter) but instead feel modern? Is it the amount of black in them? The fact that they are matte? Is it the quality of the paint and the pigment that gives it movement and texture??? I DON’T KNOW AND I’M A PROFESSIONAL BUT I’LL FIND OUT AND TELL YOU. That above shot is definitely not the right vibe for this project, but man is it compelling and I want to stare hard in its direction. I want to be in that house and get to know those people. They put a sofa on the edge of a rug facing the other way (surely for just a shot) and it cracks me up, but I still love the shot! Will green make me feel as happy and soothed as blue does? Maybe. Or will it look like a 90’s wanna-be-modern-color that really just dates the whole house? WHAT A FUN EXPERIMENT!! This dark jade in the shiplap looks GOOD and cozy and warm. For a bunk room, I’d do that in a second. The key for our house is choosing tones that look natural and then applying them in a way that amplifies their nature inspiration. No royal blues or emerald greens here. We want tones that are more muted and soothing, but then we need to apply them so they aren’t the star – the nature and the architecture need to be in charge here. I’m down for the challenge. This isn’t an ‘I design, You decide’ because I’ve already decided. I want these colors to help shape the tone and feeling of the house. I want it to feel happy but cozy, moody but in a soothing way. I know I can paint all the rooms white and get likes on Instagram, but if that’s not what I want to live with then why consider it? Are you into moody? 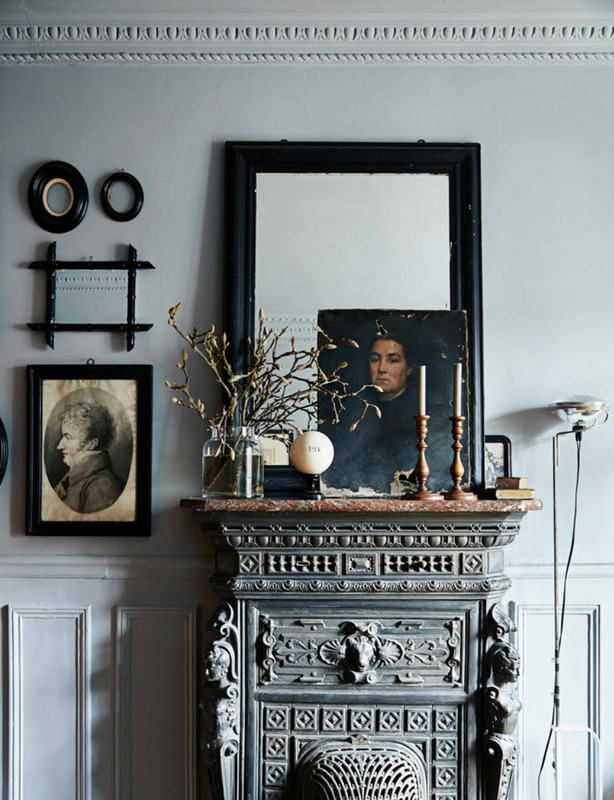 Are you ready for less all white walls and interested in some deeper tones, darker colors, and a moodier, cozier feel? Yep, I think I am too. Weigh in, folks. Because if you are into it I’ll test a ton of colors and help us all figure out the best, most sophisticated blues and greens. I’m up for the challenge – just say the word. I’m with you on the moody blue but that green…nope. But having said that, with any color, once you seen it in your space with the lighting etc., it could be great. I find I am amending my old rule of no green, gray, black, or brown. A little. #teambrian here too!! These dark colors will only work if you incorporate natural finishes into this house! Don’t loose sight of what American mountain houses really look like – none of those pictures say natural get away to me. I love the blues. All of them. Current fave for me is Van Deusen Blue by BM because it’s navy but also sorta peacock and looks amazing in my interior dining room (and powder room). I like that color too! It’s the back of my bookcases. I love the blues more (blue is just my favourite!) but I’d be really interested to see how you work with the green! Definitely feeling this moody vibe!! I hope you go moody! Although the fresh clean look is pretty to look at online I’m getting tired of it. The muted blues and greens that you are contemplating remind me of why I love forests… mysterious and inviting! Darker wall colors are definitely a coming trend. I’ve been seeing them more and more for the last few years and thinking that their time has come round again. 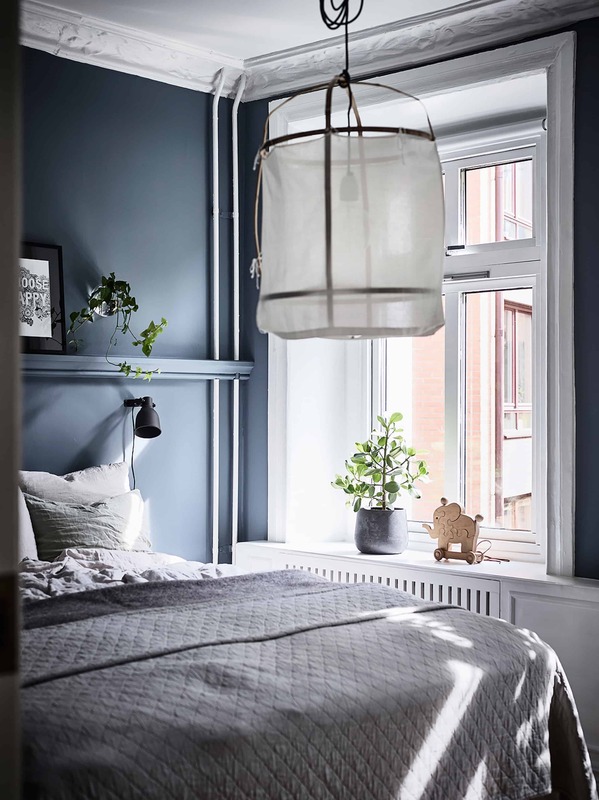 I love light and light colors, HOWEVER, there was a photo of a bedroom painted Hague Blue that I saw 3 or 4 years ago and it stopped me in my tracks. I’ve seen it a few more times and every time I see it I love it more. And I’ve even started wondering what would happen if I maybe painted just one wall that color I’m old enough to have seen this happen before. This is exactly how trends change. It’s like painted furniture- for 10 or 15 years everyone is painting wood furniture, then you start seeing a few pieces of natural wood furniture that just look really good to you. Then, suddenly everyone is stripping the paint off and showing natural wood. And the tide has turned and all you see is stripped wood everywhere. All of these pictures really attract me. Some of them I really love. I can’t wait to see where you go with this. Maybe I will paint just one wall a nice dark color. I know the zeitgeist is just such a strange thing. And after years of painted kitchens we are all of a sudden seeing and wanting raw wood cabinets again. The shiny maple killed it, but its headed back! But man its more expensive …. debating both for the cabin (and no, painted cabinets won’t be out). 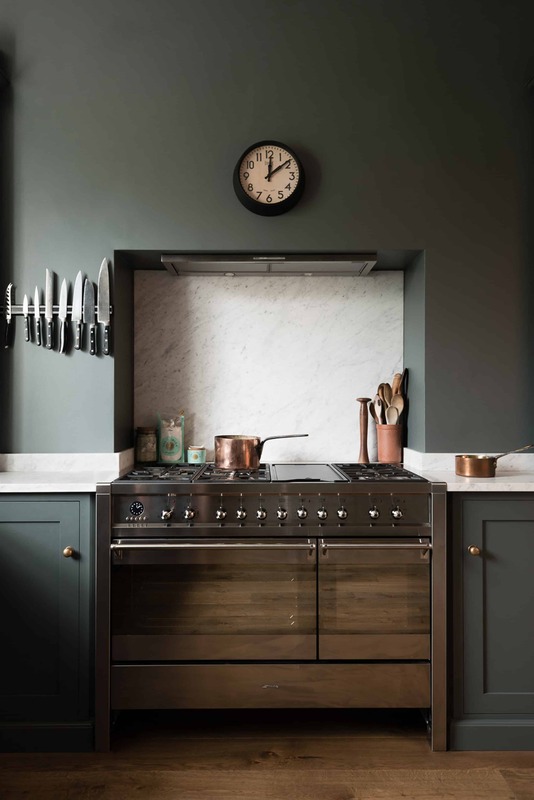 That green painted kitchen with the white marble (and beautiful stove) is divine! Thank you for the inspiration! As always! I’m loving the moody blues and greens in these inspo pics. I’d like to see those colors used along with moody raspberry and moody marigold. The current design trends and typically what fills up my Pinterest and Instagram are all about making white, gray, and light woods warm. The injection of color in the modern mountain will be a nice change of pace. I think if your going to go for cozy and warmth on the walls the woods need to meld well with it and the Scandi ash gray and pale tans just doesn’t do it for me. My newest favorite wood is the honey color Mango woods. I’ve been in a number of properties with these dark colours and they may look great in photos but I find them oppressive in real life. Also, many of the above options are in older properties (either with very low, cosy ceilings or very high Victorian ceilings with lots of ornate mouldings). From the photos I’ve seen of your mountain cabin, its very 1980s, very different to the above looks and therefore may be a lot tougher to pull off. I totally agree with all of this! I was wondering if most of the photos were taken in European countries because there is just something different about the light. SUCH a good point. That northern cooler light absolutely affects things and yes, most of these are from Scandinavian sites. I’ll be testing the heck out of these colors on large pieces of paper and then staring at each of them in the room before painting. But I will likely still make a mistake and repaint. My history of my old family room/den absolutely TERRIFIES me. That blue was cozy at night, but otherwise OPPRESSIVE. SHoot!!! I may not have the guts … or maybe just a guest room, it’s also WINTER and its easier to want dark colors in winter, but when its 90 degrees outside I want to be in a lightfilled white room!! I agree the light in these photos is so different from the bright sunshiny sunlight here in Southern California making it difficult to execute this “feeling”. I agree — I think these rooms are striking — and I can appreciate a deep color in, say, a restaurant or a club (or, as you say, a 1/2 bath), but if this color was on all the walls of my bedroom (or living room, etc. ), day in and day out, I would find it unbearably oppressive and depressing. But, to each his own — and I look forward to what Emily creates! Yes, some of these I recognise from uk sites. 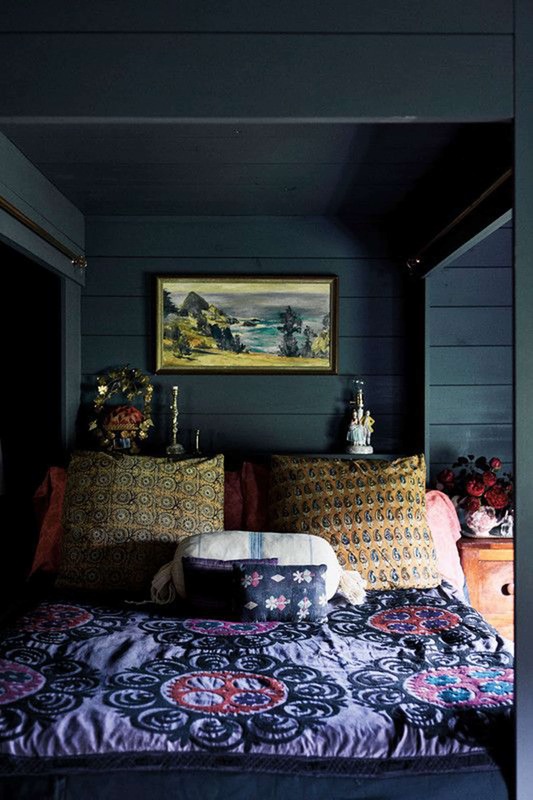 Very dark colours have been a trend (see Abigail Ahern). But a couple of uk bloggers* have gone back to white or pale colours because the darks were hard to live with. The darks look fabulous and are ok for transient spaces, bathrooms , even bedrooms, cinema rooms but not for large scale use in living spaces. *Lisa Dawson and Kimberley Duran are the ones that come to mind. The right blue and green combos make me think of a tree against a stormy blue cloud (I love storms). It was actually the inspiration for the colors in my last kitchen (green walls, dark blue cabinets). Yesss. I love this combo in the great outdoors whenever I see it, and is inspiration in my own home as well. Don’t listen to the green haters! I’ve been slowly and unconsciously morphing my house full of blues to a house full of greens, and I’m loving it. Try Newburg Green from Benjamin Moore historic colors – it changes all day long and I’m obsessed. Used it for clients too and it’s different and excellent in each room it goes in. Agree. Yes, green is a gorgeous color for inside the home! Practically every shade found in nature can be translated for the interior. I LOVE Newberg green, too. Maybe it’s just because you’re posting this in February and I live in Chicago, but these rooms are like the essence of seasonal affective disorder to me. Don’t get me wrong, some of them are also beautiful, but in a tragic way, like a French concubine succumbing to consumption. I don’t doubt that you’ll do a version I like, but dang, some of those rooms are depressing. LOL “like a French concubine succumbing to consumption” really made me laugh! I’ve got a huge swatch of F&B’s Green Smoke taped to my dining room wall right now. So glad to see color make a comeback! that is what is on my kitchen island and I LOVE it. Maybe I need to just do the bottom half, maybe stained on wood instead of painted? If that’s the color on your kitchen island, than I’d echo the comment above that warned to watch the light. I know there’s some Level adjusting and Instagram magic at work in your kitchen photos, but your island and the sheet of painted board hanging in my south-facing Chicago dining room could not look more different. I think you’ll have to go darker and greyer with your color choices to achieve this post’s level of moody saturation in the California sunshine. The stained wood idea is an intriguing one! 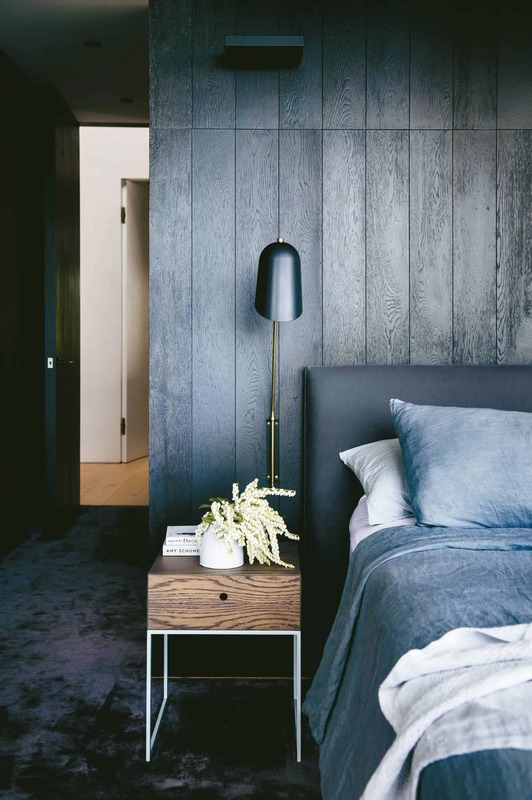 A kind of textural color wash on wood might feel more in line with the Scandi Cali Cabin you’re going for (though I think doing it on half the wall might go a little more cottage?). We are building a weekend cabin with a loft space for kids. Mine are older–ten and seven–and I’m thinking about using hammocks instead of beds. Ideally, their friends would just bring their sleeping bags when they come and laundry would be simplified. No one has seemed to have done this, so maybe there’s a catch I don’t foresee yet! I think that Emily can pull off anything, so I’m along for the ride. That being said, most of these photos are not what I’d think of as being Refined Scandinavian Chalet, Scandinavian Cabin, or Refined Scandinavian Californian Cabin. (Whew, that’s a mouthful. 🙂 ) A lot of these photos, and the photos from some of the fireplaces, are way more what I’d call “relaxed traditional” than Scandi. Totally agree! Where is the blond wood and whitewash I associate with Scandinavian/Danish/Swedish design? This is a little Edgar Allen Poe/Edward Gorey/Modern Victorian to me. You guys, this is just for paint color reference, don’t worry!! I agree — I get that they’re just paint color reference, but to me Scandinavian always means white walls. One of my best friends did an exchange year in Sweden during university, fell in love, and has been living there for the last 20 years. 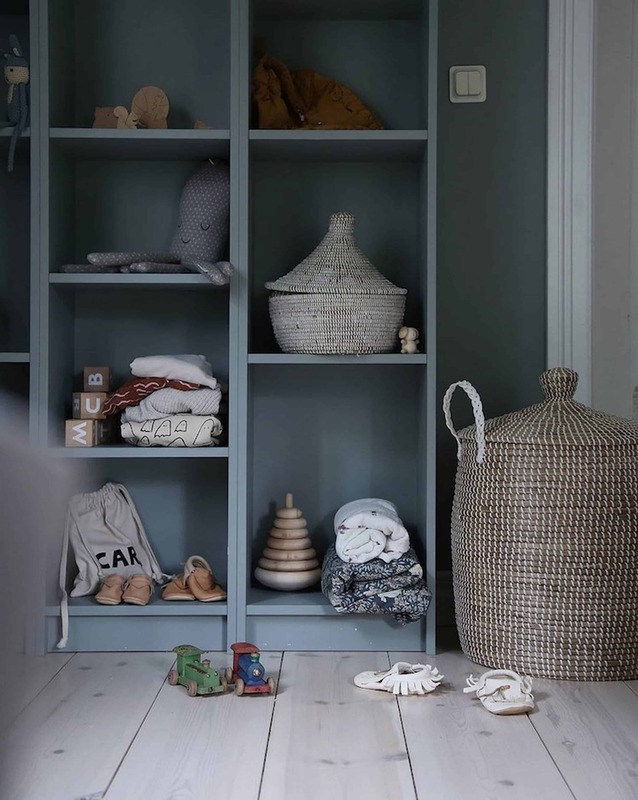 We visited them this summer, and she mentioned that the general feeling/rule in Sweden is you have not-too-light wood floors to keep you grounded, and light walls to keep things not too oppressive. The reverse (dark walls. light floors) is thought to be topsy-turvy and a recipe for psychological maladjustment or something. I was amused, but also agree because ever since I was a kid in the late 80s I’ve liked warm wood floors and white or near-white walls and I feel like light walls help me through Canadian winters. To me, these colour samples are more moody and less cozy, I’m with Elizabeth in Chicago on feeling the Seasonal Affective Disorder ramp up just looking at some of them. But the California context makes a difference. You’ll have a lot more light in the winters than they do in Scandinavia (or Chicago, or Canada) and I believe you can make the darker walls work. Great post! So much inspiration. Sources for the photos? I’d love to click through to see the designers’ other spaces. I’m loving your cabin series. My fave part of your blog and Instagram stories is watching you work through the design decision process, the transparency. You and the EHD team rock! I know you have high-end colors and brands at your finger tips, but no joke, look into Autumn Fog by Valspar. Smoky blue with the perfect amount of grey. We just almost doubled our home with an addition (still waiting to move in!) and painted the master that color. It could not be more perfect cozy moody soothing blue! Emily–I just sent you an email with some pics of the color in our room. It’s so pretty! Kimmy–That was fun to read! I hope you love it as much as we do! The moodier the better! The saturated white palates that have dominated the last few years seem so flat boring and I am VERY into the darker hues you are being inspired by! I started buying into the moodier colors a couple years ago and went navy with my baby boy’s nursery. My husband was terrified and now he loves it and how it’s really the coziest room in the house. I also mentioned a deep forest green on the walls, which he wasn’t going for. So I’ve introduced the green a few other places-a throw here, a lumbar pillow there. It’s worked very well and I think I almost have him on board for painting something a moody green. For what it’s worth, the navy we chose reads more “gentleman’s lounge” while I think the green would have read more “mountain man.” One hundred million percent go bold and moody, but I am feeling that green for your cabin pretty hard. We used Gentleman’s lounge at the barn makeover and loved it, too! Oh wait, i think it was gentlemens gray … nevermind. .. I used Farrow & Ball, “Light Blue” (color matched to Behr paint) for my bedroom and it is the perfect shade of light blue that is not too baby blue. It’s got a note of green undertone that mutes it just enough to keep it from going baby but doesn’t turn it into mint. I have plaster walls and the color had so much depth on the texture. I would definitely recommend giving it a try! Ooh i’m interested. Thank you! Yes to all the moody blues. And if anyone could convince me on the green, it would be you. Love the moody grayed out blues and greens… that’s my jam! 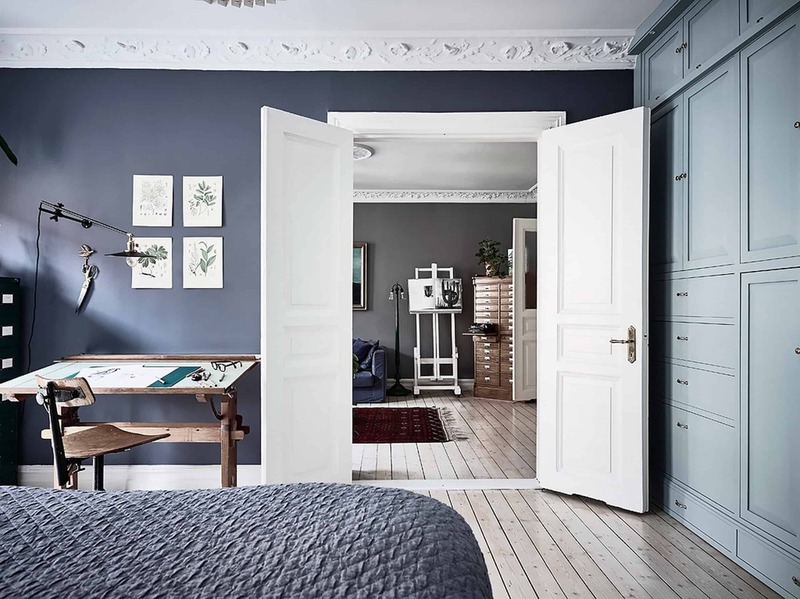 I think you are on the right track for bedrooms and bathrooms and then you could use the lighter Repose Gray with the super white trim and use blue and green and natural wood for accent colors in the main living, dining and kitchen. It will look spectacular! Perfect for a mountain lake cabin and give you all the feels of what your going for which sounds like a combo of the two styles we voted for…I’m okay with that. I think its going to be great! Looking forward to the color swatches! And yes, like one of the above commentators, I am in Chicago and I both love and fear the dark rooms. Though we painted our dining room BM Dior Gray with white wainscotting and trim a couple of years ago and the room FINALLY works vs. the much lighter Devon Cream and then Bunny Gray that I tried in previous years. I LOVE that second-to-last picture, with the muddy jade green and the natural wood planks on the ceiling! I love these moody colors, especially where the contrast is wood, cream, gray etc. I don’t love them when a stark white is right up against the deeper hue — to me that looks very dated contemporary. I am really looking forward to all of the posts about this cabin! Greens greens greens please. Blue-greens. And greens. The blues are nice and calm but don’t really excite me or illicit feelings of nature really. But those greens are doing it for me! Love this- all these shots and moods are totally talking to me. FWIW, we painted our bedroom Benjamin Moore “Tranquility” and I absolutely love it every day, because it makes me feel, well, tranquil. Also, I am curious about tree coverage on the house — is it going to be a lot darker when leaves are in full bloom? Only because darker rooms when there’s not a lot of light coming in can feel kind of gloomy, and foliage has such a major effect on sunlight. These blues are what I thought I saw in the pictures from Corbett’s house (upstairs). Turns out it was just a reflection, but I’m still on the hunt for that look to add to my home. I like the moody blues! I think it’s harder to get moody greens right, as they can look muddy. I used Ralph Lauren’s Kauai in our master bedroom, which is a lighter green than the ones you pinned above, but still gives a moody vibe. It worked nicely with the light in a house in Los Angeles, and also looks great with the very different light in our current home, a Tudor cottage in New York. You ask if I’m into the moody? My husband and kids would for sure say yes, I can be very moody 😉. I just love your line about the packaged snacks. I’m sorry, it made me laugh out loud. This was a really fun post. You are hysterical. I love this post. Thank you for being normal. I hope you’re enjoying this process, because I definitely am! Whoa. I love you, Em, but these photos are like the design equivalent of major depressive disorder to me. Definitely not cabin getaway in the woods. Unless the cabin is where I plan to drink and pen a sorrowful opera. I love moody colors, but mostly in spaces with classical architecture and upscale decor. I’m a little surprised to see you going in this direction with this house! I would think you’d want to keep it light and bright to contrast the stone and wood. Even with a lot of natural light, dark colors are still…dark. You are designing from a sunny place – I look out to the grey skies here in Portland at the moment, and those moody colors make me feel a little down. YES to that dark (blue?) wall-to-wall carpet for a bedroom. It looks amazing and cozy. you make me so happy going more cabin. and I need me some happy. fell down a flight of stone stairs in mexico and wound up w/ a badly broken right arm; shoulder, wrist and metacarpal. back home again and looking for diversion. bring on the cozy cabin. I love these colors, including the greens, and I am excited to see what you do! As a person who lives in a 1972 house in the woods and who has never been a white-walls fan, I am watching your design of this home very closely. I love moody coluors in smaller rooms! Go for it! 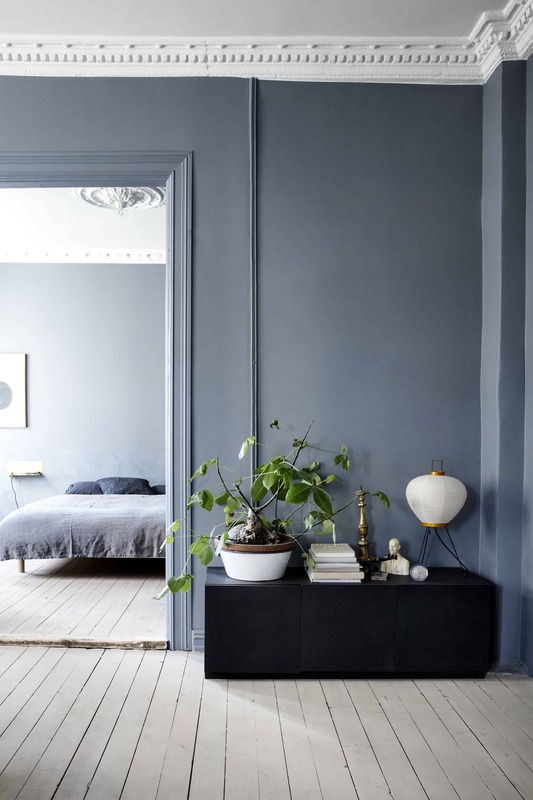 A dark blue would be really pretty in the master bedroom. I love green moore than blue, but to me it seems harder to find the right shade of green. Maybe it is because blue is a much moore calmer colour than green? I really like the light green colour “tant johannas grona” (google it), it manages to be both light and moody at the same time. I painted our master bedroom Hague Blue by Farrow and Ball and I LOVE it. It definitely turned out more navy than the blue-green I’ve seen on the internet, but it is a lovely color. I’ve always had a light colored, airy bedroom so this was a huge change. It just feels so cozy and warm now. I do think it works in my room because I have many windows (5) and all white painted trim. And I bought a white duvet and bedding as well. I think it would look great in your cabin! And I forgot to mention that I live in the Midwest with many overcast, gloomy, freezing days and the dark blue walls are not depressing at all in a bedroom. I wouldn’t want it in a living room, but it does make our room feel snug on gloomy days, and I actually think it really highlights the windows and the light on sunny days. ohmygosh!! All that talk about blue that looks baby blue, but not baby blue when the lighting is perfect and it’s styled perfectly is exactly what is going on in my home. I love the bright, airy, light feeling during the day, but at night it’s just baby nursery blue. And I’m home mostly at night. And Ben Moore paint is expensive. Soooooo. Also, I love all the yelling in this post. IT’S HILARIOUSLY DRAMATIC IN THE BEST WAY! LOVE! I really think you will find a beautiful way to incorporate some moodier colors while still keeping it feeling like a warm cabin – you never cease to amaze me! Really love the shot towards the bottom of the dark walls with the light wood shiplap ceiling. Something about the ceiling screams “cabin!” so it keeps the paint choice from feeling forced in the context of a mountain house. All right, yes! Following so closely for my own home. The main open plan space is white but the bathrooms and bedrooms don’t have the vaulted ceiling or huge windows so I want to go moodier there, and natural blues and greens are always my favorite combo. They’re already the color accents in the bright part of the house. I’m SUPER INTERESTED in what you find out about those moody greens and how not to make them look like dated hunter greenl on the walls. I’ve noticed and wondered the same thing – the matte texture is definitely a huge part, sometimes even has a plaster type finish or variation in the paint. PLEASE do this for all of us paint-color-failures! For the life of me, I cannot translate paint colors I see on screen/Pinterest to an actual paint line and color. Find all the good moody colors and tell us! And maybe in widely-available paint lines? pretty please?! I like it. I just painted one of our rooms Marlboro blue by Benjamin Moore and it can definitely look sorta baby blue, but I’m anxious to see it with the flooring and all else. YES TO ALL OF THIS. I. LOVE. COLOR. And the “all white walls to brighten up a space” thing is driving me crazy, 1. because I just love color, 2. because in a lot of houses it doesn’t work in “real life” even if it looks good on insta and 3, it’s been done so much. 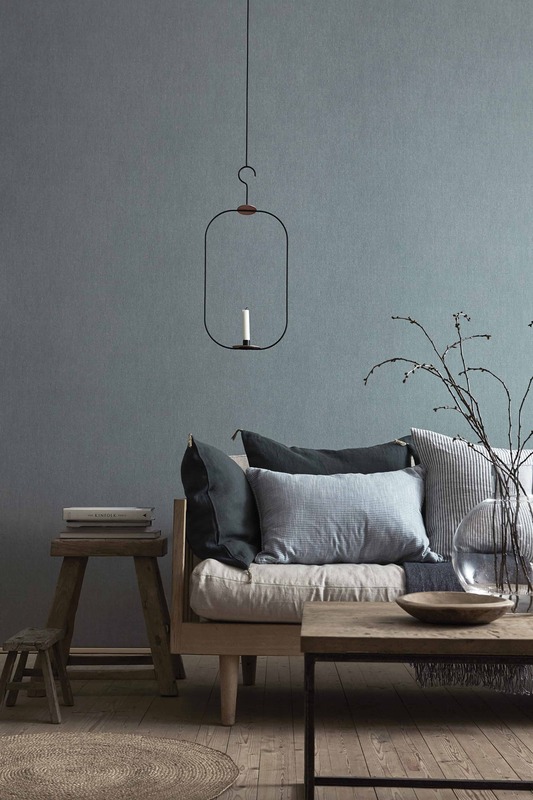 I love these moody colors, and selfishly we’re thinking about a moody blue for our bedroom, so would be super interested to hear your recommendations. The “dark jade shiplap” image is perfection. There is something in the stain saturation on raw wood that strikes the perfect balance of earthy and sophisticated. Oh, I love where you are going with the colors. I have to say, though, looking at the images I just kept thinking “Will somebody please turn on the lights! ?” Haha! I like the cozy, but too much I think it might get depressing? Looking forward to following along with you! YES YES to a color round-up! This is the exact look I’m going for in our basement remodel. I would love your suggestions. My husband hates to turn lights on — it’s weird — so I often lean into it and go dark and moody. I think it works as long as you have good task lighting and you don’t have it everywhere. Mirrors help too. 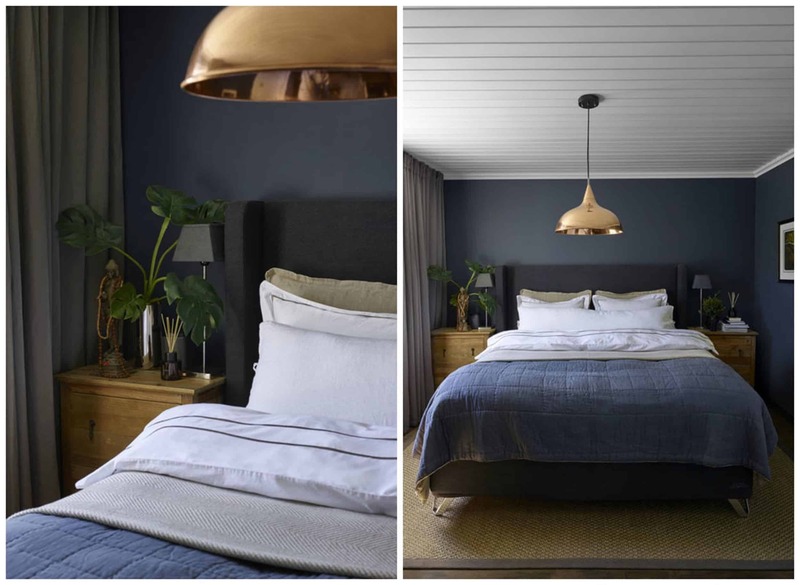 In the summer, a “cool” feeling, dark retreat can be nice (well suited for bedrooms). For the mountain house specifically, I really like the pictures with the pickled floors, and that really seems to lighten the rooms. My husband too!! He would eat dinner in the dark if he could!! Oh my goodness yes thank you so much! First: COLOR PLEASE. Second: “if there is one thing that turns Brian on its a ‘modern paisley settee’.” This made me laugh inappropriately at work. THANK YOU. Please please please do a moody color round-up! I live for your pastel round-up, and ended up painting my extremely lovely bedroom Quiet Mint (and it’s going to go in our guest bedroom too). It’s such a delightful color and it was so critical that you had played with the color and approved it first! Your post really conveyed a wonderful feeling and made me want to go to Sweden. Thanks for sharing! YES to all of it. I’ve been on the lookout for these shades for our current house reno. I’m not sure we’re brave enough for the super dark versions though, so I’d love to see you test some muted/moody blues and greens that are light to medium-toned as well. And I love your advice/warning about blues looking to “baby” – Will definitely take that into consideration! Love the greens! The blues are lovely too, but is it just me, or do blue walls make anyone else feel bummed out? Somehow being surrounded by muted blues makes me a teensy bit depressed. And it’s my favorite color! I always enjoy greens, blues, and grays. They are my favorite colors and never get old! I love the idea of moody wall colors, but am always worried it’ll simply make the room feel dark/oppressive and so I’ve never tried it… I’m excited to see how you incorporate these colors into your space! No more blue! Moody green! I would love for you to find the perfect green. I’m about to paint my kitchen cabinets a moody deep green and am having a hard time finding that perfect color. I’m all for these this color palette. EHD – I am loving all of these beautiful, calming colors. I especially love the very first blue bedroom, followed by the blue room with those great black/white doggy photos, and lastly, the first green kitchen. Would love to know the colors and who makes them. And, while I don’t live in a Swiss chalet, since I live in Switzerland and have visited many chalets, a little warmth is definitely the right move! I just painted our living room Ripe Olive by Sherwin Williams…. I want to lick my walls! So warm and happy and cozy. The room as a solid wall of windows, so almost feels like I am in the trees. Love the moody mood! It feels like it will encourage relaxing. And this made me so happy: “…if there is one thing that turns Brian on it’s a ‘modern paisley settee’.” Hilarious! I am into it! More on this please! And yes to showing test colors. 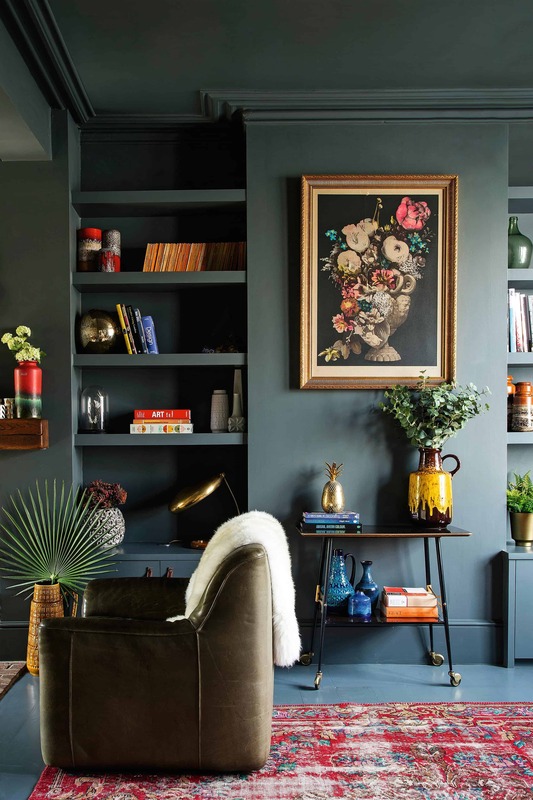 I am LOVING all of these color inspirations and, as someone who has gotten no further than pinning photos of moody-colored rooms, I am counting on you to lead the way! I still love light and bright in bathrooms but I’m ready for more depth, mood, tone, and texture in every other room. I am drawn to blues…… but blue in your above photos say seaside, not mountainside….! Um, I would have voted “moody” in a second! Tired of all the white and gray (when people are feeling brave) and this feels so refreshing. Blue or green, I love them both. It’s just so cozy! I am loving these colors but not necessarily on the walls in a California sun-infused cabin at the beach. Why not on kitchen or bath cabinets? Or an accent wall somewhere? Although, I LOVE the kids bunkbed image with blue walls. I can kinda see that, but having these very dark colors on the walls would be kinda depressing I think. California will get hotter (and maybe lighter, who knows??) what with global warming and all. Go for it Karen! It sounds like a beautiful color. I need to check it out since purple is one of my favorite colors. I picked a muted purple shade for my kitchen and I was surprised when my hubby went along with it. I have the paint but haven’t painted the room yet. Yes I’m super into this. I love it when you talk about color choice and what colors are inside other colors. And how to get what you’re going for. (Example above about the perfect soft blue vs baby blue). I have Stonington grey BM walls. They look perfect blue or grey depending on the light. Never baby blue because it’s a grey. I like how all day long the walls look different from the morning to the night. Then I can never get bored. They might read well on furniture too just like that bookshelf from your inspiration. Also–don’t feel the need to create something new every design. What you do is just good. One of the reasons people love Joanna Gaines is that it’s the same good thing (give or take a few odd shows and spaces where the people wanted modern or French country) over and over. I could watch her do the same thing in a different space so many times. I feel that way about your design too. I would still enjoy all white walls and the moody textiles and accessories. I love Scandinavian, but I also love the rich, moody, cozy vibe and with a mountain cabin, you MUST do the blues and greens with all that stone and wood. Makes me want spiked hot chocolate NOW! Moody Blues? Do your team a favor and play them Tuesday Afternoon by the Moody Blues. You might be too young to have it running through your head? SO GOOD! I love the blues! 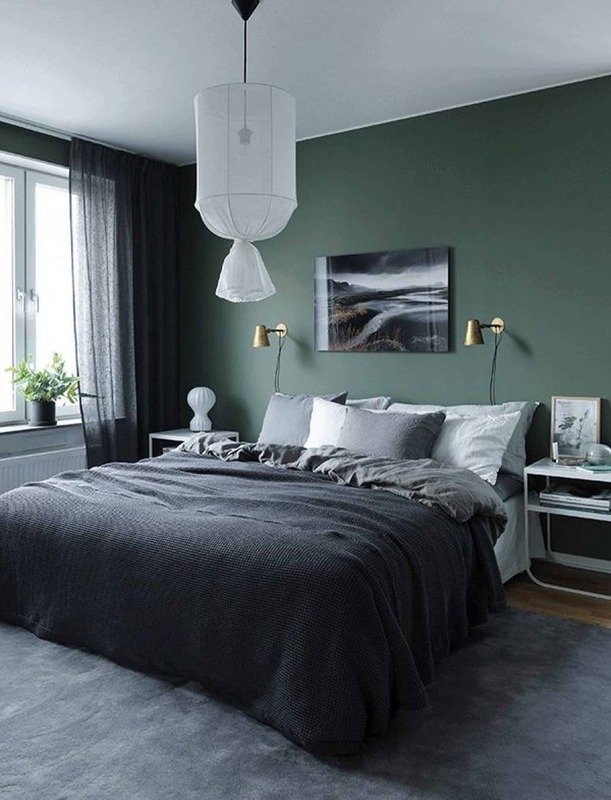 The darker shades will definitely give a room a very cozy feel (although I prefer the lighter shades) and I really like the three greens with the blue undertones. We’re planning on moving to Florida and I might just steal some of your color choices for our new home. I love some of those blue walls, just not too dark. I think they will look great with lighter natural floors and furniture. Besides, blue is your signature color. I need those kids polka dot bedding linens in my life!!! Could not be any more fun. Great post. I couldn’t stop laughing! Yes! Please test out these colors and tell me what’s not going to be tacky Hunter green. I Iove this mood and every color I test is ridiculous. Finally, the spell is broken and the elephant in the room has been exposed with these five words…“minimalist, stark, museum-like hole”. I’ll grant you that “stark” makes for dramatic, artsy photos but the truth is it’s not really livable. Or at least livable without Xanax. All about a Smokey green!! I love everyone single lamp and light fixture in this place! Will you be making those details available by chance? Green. It reads more “mountain” and I think it’ll go better with the wood. Also, DEFINITELY do a dark bedroom. Not for yourself (you like soothing and fresh) but for the guest bedroom, for sure! Love love love this! I adore moody blues and greens! Most of my house is white but our basement is a blue gray and powder room is navy wallpaper. They are so warm and inviting. The way the light filters in from the windows and reflects off the walls is just magical. Have you watch Pride and Prejudice with Keira Knightly? You must. I just swoon over the light and moody walls. I am loving this segment and hearing all about your remodel! I’m actually shopping for a mountain house in Colorado now. I painted my bedroom Benjamin Moore Jojoba which is a darker green but a bit warmer than some of these. With wood floors it feels like being in the forest in the best way. Cozy but not raining [which here in the PNW matters]. I like the darker colors and think you should go for it. Think of how nice it will feel coming in from a hot sunny day. I love the moodiness in all of the spaces! 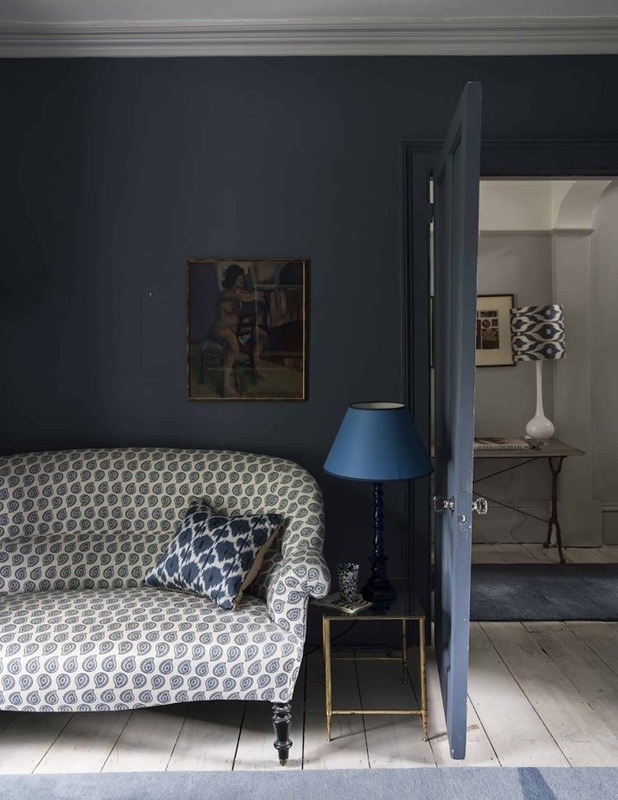 I’m about to paint my entry hallway Farrow & Ball Hague Blue, very dark and moody, blue leaning toward petrol, and I live in Stockholm, if that boosts your confidence in any way! Wish me luck! Our entry and guest bath have been painted SW Knoxville Grey for well over 10 yrs and I still love it. In our house, it reads more blue than green. The photos on SW site looked more green to me. Loving all the blues you showcased. As for the green, the first two images are yummy. I don’t really care for greens with yellow undertones, just my preference. Can’t wait to see what you pick! What a Rorschach Test these colors have been! Count me among the too-moody-for-me crew. There’s edgy and then there’s depressing. These colors are the latter to me. The Emperor isn’t wearing any clothes! I mean, Those are all shades of grey! Sorry, but even after adjusting my monitor all I can see is varying shades of grey, and in some of them I can’t see the blue or the green at all. Fair enough if you want to use shades of grey, but call a grey a grey, please. I love your blog but I am getting frustrated by the ever-shrinking colour palette. I know you can do non-grey colours because you used to do them when I first found your blog. Can you bring back some, of not all, of those colours in the mountain house/cabin? Ha! I see lots of blue!! Love, love love love, love love love!!!! Blue on blue on blue on blue! Happy you are tapping into your color genius side of you!! Please get into those colors!!! We went with a dark green accent wall & ceiling in our master bedroom (with huge picture windows looking out into our woods) and man is that the most magical room in our house. Sherwin Williams Retreat accent and ceiling with Drift of Mist walls and a dark gray trim. If you have enough light in the house, and it seems like you do, I don’t see how you’d regret it. So excited to see how things turn out with this moodier bent! I love dark moody rooms ! I had my room black as a teen. I like the moody colors! You’re in the forests of Oregon and the kind of mysterious quality of the moody colors supports the wonder of such a beautiful and kind of mysterious landscape. Plus I think it would be cool to do something that contrasts a bit more in tone to your current house! As a general side note, I wish that you would give more explicit credit to the creators of the images you’re using as inspiration. I know that you put “Photo Source” with a link under every photo and I understand that it’s a really clean and consistent way to do that since sometimes you’re drawing from designers and sometimes you’re drawing from websites and captions can get cluttered. It’s just that you’re showing some really beautiful imagery and you have a large audience and a lot of influence, and it seems like the designers/organizations and photographers who created that beautiful imagery should at least get their name(s) under the photo instead of just a link to their website. Plus links become broken as people restructure their websites and sourcing with names allows them to be credited permanently with less opportunity for error. I know you spend a lot of time and money on the content you’re creating, and you would probably appreciate more than just a link to your blog page when someone publishes your imagery as their inspiration. I love reading your content every day and I’m totally supportive of you moving more towards a website/excited to see where it goes! I hope you’ll consider how you credit sources as you move in that direction. Yes, bring on the moody colors! There is an over-saturation of white walls these days, and people need to see the wonderful merits of color! You can totally pull this off! I vote for color. The moody tones are beautiful, and I don’t think they will be too oppressive if they are in the bedrokms and bathrooms. 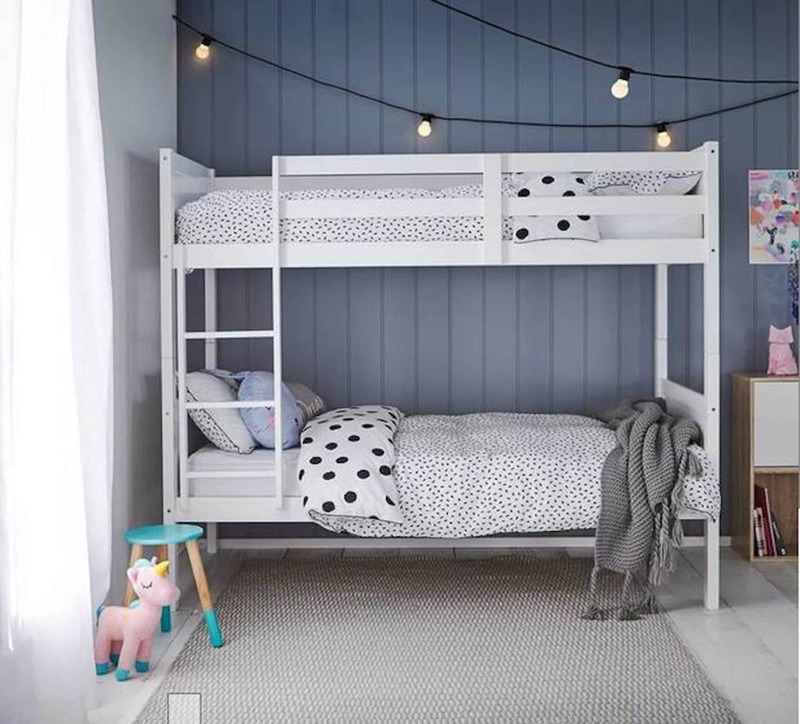 For kids bunks, check out Beddy’s. I read about them on a blog and am in love. They are great for my daughter, who used to manage to get all of the sheets untucked every night. They are like a sheet/comforter combined with a sleeping bag. I can’t explain it, but you will thank me when it comes to bunk beds. Colors!!!! All white is beautiful but such a pain with young kids, dogs, etc. And I loooove the wider shots of entire rooms that you’ve shown – more of that on any and all posts! Anyone can make a pretty little scene, but seeing an entire room is great inspiration for my own house! Yes!!! I’m sick of white walls. And I would love to see which blues and greens you choose. My absolute favorite wall color is Benjamin Moore’s york gray. Can read as so many different colors depending on light/styling. Green, gray, etc. I’ve painted two whole houses with it and still love it. Looks light on the swatch but adds a lot of warmth without being dark. Also, the problem with dark colors is they really highlight any flaws in your wall. I look at that first photo with the blue and see every drywall seam and popped screw head. I used to live in a small house in the country where I painted the walls above the wainscotting a dark teal. Sometimes it felt like too much but most of the time my eyes were just drawn out the window and I loved that. Like the windows were the art. In my house now I kept the walls light except for our bedroom. It’s navy and so so cozy. My husband doesn’t like a smidgen of light so he likes the darkness of it. I could sigh just thinking about going in there. DO IT!!!! We all know how white walls work at this point. Excite us with something new a beautiful! I’m actually in a Norwegian mountain cabin right no, in a ski resort area. It’s decorated with dark grey walls, dark navy blue velvet sofas, furnitures in grey washed oak and some leather details. It stunning! So modern, yet cozy and with a traditional feel to it. We did dark navy walls (BM Bold Blue) in our kitchen remodel last year (against advice of our designer). The cabs and counters are white and we have white and gray tile, plus medium wood floors. What’s been most surprising is how much of a “neutral” the navy is. As I’ve changed out things with the seasons, it all looks great with every accent color (turquoise and yellow for summer, pinks and reds for V day, red and green for Xmas, burnt oranges for Fall and Halloween, pastels for Easter, etc.). Also, the few pieces of artwork really pop against the walls. We are so relieved that what we were told was a “risky” choice has been so easy to work with! HELLLLLLL YASSSSS!!!! Please do moody…the feel of these spaces is so inviting, calm and relaxed – all three feelings required for a mountain/lake cabin! Please show me something different then all white, or gray everywhere or farmhouse (gasp!) Let’s be crazy (crazy Emily is definitely the coolest), so I say go for it!!! sherwin williams refuge is the perfect shade of blue in any light. Its perfect for a bedroom with lots of white, wood, and fur accents (looks better than in the google pictures, trust me). Atmospheric by benjamin moore is a tinge more green/jade, yet also beautiful. These rooms seem so dark & depressing, and in the summer I think they would feel oppressive. Also, I think the natural greens & blues from the outdoors should be the real centerpiece. So lots of windows to let in the natural light and showcase the outdoors in all its glory. I would personally save the blues & greens for either bedding, accessories or how about a blue chest of drawers or mossy green kitchen cabinets with natural, white and stone accents. I painted our bedroom once a moody purple, and I loved the drama, but after a year I truly felt depressed in that room. I was starving for lightness. Already committed to a different color direction in our brand new home but man oh man I am drooling over your pix. Good luck deciding!! While I love a few of the lighter blues and greens in these photos, I can’t appreciate the really saturated, dark tones. All I think about is the dark walls sucking the light and life out of everything in that room. Some places where it’s only one wall, with the rest quite light, that I could like. But a kids’ room or guest suite? It’s not inviting or cheerful. 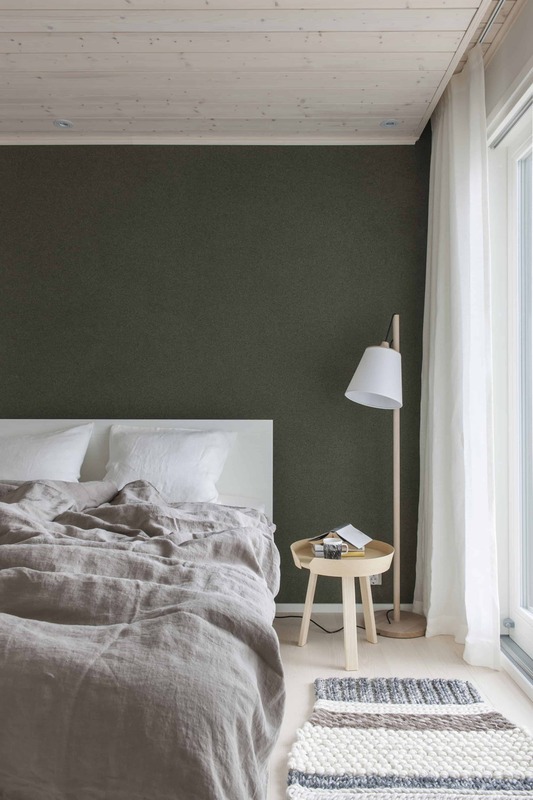 Along these lines but more livable, and cozy: I love me some “washed out” hues, like washed linen bedding, in medium-to-light blues, greens, blushes. That would be in keeping with the natural inspiration for the refined cabin yet bring warmth as well as atmosphere. When we bought our house three years ago we painted most of the main floor one of those moody blue colors and I had not regretted it for one second. I read once that the sky is blue which means everything looks good with blue and it’s totally true. What I’m trying to say is, DO IT. That jade ship lap is my dream!!! I love where you’re going with this. And THANK YOU for not going all-white. I’m honestly bored of the endless white homes in the design world. It always looks good, but without those pops of SOMETHING NEW, it just looks dated to me. Ha!! !